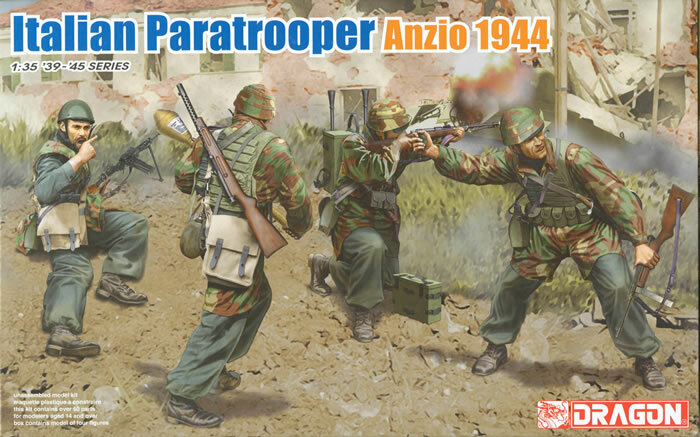 Like other modern armies the Italian Army formed a paratroop division - Folgore - just prior to the major actions of WWII. It fought in a number of campaigns and areas, but in 1944 its remants were formed into the “Nembo” group of the Italian Co-Belligerent Forces and fought with the British to help free Italy. But as is often the case, of course the Fascist RSI forces also had a “Nembo” group formed of members of the former “Folgore” airborne division. This particular set from DML provides four members of this latter group. Their uniforms appear to mix bits of Italian and German uniforms (Italian helmets and vests and German camouflaged Fallschirmjaeger smocks) with Italian and German weapons and kit. The set provides four figures in “in action” poses: one man with a Breda Model 30 light machine gun, his other number running with a Panzerfaust 60 and carrying a Beretta submachine gun, one man firing a Carcano carbine but carrying what appear to be spare barrels for a light machine (apparently not a Bren Gun!) and a case of some sort – radio? – in a kneeling position, and one throwing a grenade, also armed with a Beretta. The figures are provided with canteens, entrenching tools, packs and pouches, and two sets of desert goggles. Each figure comes in “Gen1" style breakdown of six parts – head, torso, arms and legs – and is in a set pose, but the hands are separate on most of the figures. The set comes with a generic weapons sprue of Italian weapons – indicating there may be more sets or “users” in the future. The set provides one 6.5mm Carcano carbine with bayonet, one Beretta submachine gun with stock, and a 6.5mm Breda Model 30 light machine gun. This comes with a separate side-loading magazine and bipod. The weapons are conventional moldings and do not come with the “Gen2" features of optional position breeches or hollow muzzles. A second Beretta is on the main sprue along with a two-piece Panzerfaust 60. The painting and assembly directions are on the box front and back, and are done by another of DML’s unknown artists. While tolerable they are not as well done as the Volstad ones. Overall this is an interesting set which will be a bit harder to match with a vehicle. Thanks to Steve Barker for correcting the original review.